KENNEDY SPACE CENTER, FLA. – The eyes of the world are on Space Shuttle Discovery as it lifts off at 10:39 EDT from Launch Pad 39B on the historic Return to Flight mission STS-114. Thisstory was updated at 1:50 p.m. EDT. CAPECANAVERAL, Fla. - The space shuttle Discovery roared into space Tuesday, piercing a Florida morning sky today and launching seven astronautson NASA's first orbiter mission since the Columbiadisaster. Afteralmost two weeks of delay, two and a half years without a shuttle flight and$1.4 billion in return-to-flight work, Discovery successfully left Earth behindon a 12-day test flight to the International Space Station (ISS) with no hintof the fuel sensor glitch that scrubbed a July 13 launch attempt. Typical Florida weather,including rain storms and a potential launch threat from electrified anvilclouds, was not an issue here at NASA's Kennedy Space Center (KSC) spaceport. "With anearly morning launch, we hope we give you a good show," Discovery's STS-114commander Eileen Collins told reporters before the flight. "We're veryprepared." Discoverylaunched right on time at 10:39:00 a.m. EDT (1439 GMT), rising above Launch Pad39B here at KSC. Eight minutes and 29 seconds later, Collins and her crewreached orbit. "OkayEileen our wait may be over," said NASA launch director Michael Leinbach just before liftoff. "Have a little fun upthere." In additionto Collins, pilot James Kelly, flight engineer Stephen Robinson and missionspecialists Andrew Thomas, Wendy Lawrence, Charles Camardaand Soichi Noguchi - of the Japanese Aerospace andExploration Agency (JAXA) - rode Discovery into space. "That hits youhard," said NASA astronaut David Wolf, of Discovery's successful liftoff. "I'mall choked up." Videoshowed what might have been at least two light-colored objects flying offDiscovery as the shuttle cleared the launch pad, and what appeared to be a largepiece of debris coming off the external fuel tank two minutes into the flight. Deputyshuttle program manager Wayne Hale raised the possibility that thelight-colored objects were harmless pieces of paper that protect Discovery'sthrusters before launch. But he insisted it was too soon to say what thecameras may have picked up, and he gave assurances the multitude of images willbe examined frame by frame in the coming hours and days. "No tellingwhat might be there or what's not there -- we hope nothing," he said. Today'sspace shot came 13 days after NASA's first attempt to launch Discovery on July13, which flight controllers scrubbed just as Collins and her astronaut crewwere strapping into their seats. A problematic fuel sensor reading during astandard countdown check forced the scrub, prompting an exhaustive engineeringinvestigation that was ultimately unable to determine the glitch's exact cause. Collins andthe STS-114 crew followed the investigation during the two-week launch delay,breaking quarantine only once during that time to visit family and friends.Then it was back to training and, ultimately, launch. "We canstill see the external tank out the window...it looks beautiful and the sun'sgoing down about now," Collins said about 26 minutes after external tankseparation. "It looks beautiful and the sun's going down." Duringtheir mission, the STS-114 astronauts will test out a suite of new tools andmethods of on-orbit inspection and repair of their spacecraft. They will alsodeliver a vital cargo shipment to the ISS, including a spare gyroscope thatNoguchi and Robinson will install during their second of three plannedspacewalks. "Thisflight is important for NASA...it's the first step in getting back to flying theshuttle and building the International Space Station," NASA astronaut NicholasPatrick told SPACE.com. "But for me personally, it's very importantbecause I'm looking forward to flying aboard the orbiter in April ." Patrick isassigned to the crew of Discovery's STS-116 flight, where he will be in chargewith directing the robotic arm and the added 50-foot (15-meter) orbitalinspection boom that the STS-114 mission will test out. Today's spaceflight isalso geared at testing potential repair techniques for shuttle tiles andheat-resistant panels, and resupplying the ISS. The spacestation was flying above the southern Indian Ocean, just west of Australia,during Discovery's launch. Its Expedition 11 crew - commanded by cosmonaut Sergei Krikalev with NASAastronaut John Phillips serving as flight engineer - watched the launch via avideo link between the orbital facility and its NASA mission control in atJohnson Space Center (JSC) in Houston, Texas. JSCspokesperson James Hartsfield said the ISS crew sent their congratulations downto flight controllers on the successful shuttle space shot. Discovery'sSTS-114 crew will now spend the next two days chasing the ISS, and are expectedto dock at the station at 7:18 a.m. EDT (1118 GMT) on July 28. 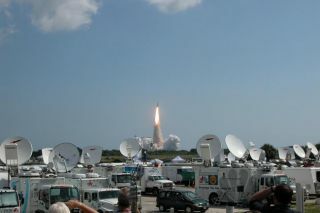 Today'sliftoff was NASA's 114th shuttle flight and the 31stlaunch for Discovery. The launch also marks the 17th U.S.spaceflight to the ISS. "It'sexciting...a gee whiz moment," astronaut Jim Reilly, a mission specialistassigned to NASA's STS-117 mission, told SPACE.com just before thelaunch. Discovery'sliftoff came after an extensive investigation by shuttle engineers to trackdown an anomaly that led one of four liquid hydrogen fuel guageto fail a preflight test during the orbiter's July 13 launch attempt. Known asengine cut-off (ECO) sensors, the gauges measure liquid hydrogen levels insideDiscovery's external tank. Four similar sensors inside perform the same functioninside Discovery's liquid oxygen feed line. All eight of the sensors aredesigned to shut down Discovery's three main engines before the external tankruns out of fuel. The faultysensor read 'wet' - indicating a full external tank - during a test in whichlaunch controllers force the sensors to read 'dry' - indicating an empty tank.One sensor continued to read 'wet' in the test, prompting the scrub. The glitchwas similar to sensor problem experienced during an April tanking test with adifferent external tank, though a second check of that fuel tank turned upnothing suspect, NASA officials said. "We may notever be able to determine any exact single failure for this problem," NASA testdirector Pete Nickolenko said before the flight. After theApril test, engineers replaced wiring and other hardware associated with thesensor system. They also switched Discovery to a new launch stack in order touse a new external tank equipped with an additional heater to prevent iceformation. The investigationfollowing the July 13 launch scrub found some hitches with electricalgrounding, which engineers resolved, as well as the potential ofelectromagnetic interference from other external tank and orbiter hardware.Additional sensor testswere instituted during Discovery's launch countdown to verify the ECO sensorswere working properly. "You go throughso many trials and tribulations, to go through that troubleshooting from thesepast couple of weeks [makes] it more special," Discovery's vehicle mangerStephanie Stilson told SPACE.com before thelaunch. Discovery'sSTS-114 flight is NASA's first shuttle launch since 2003 accident that claimedthe lives of seven astronauts and destroyed the space shuttle Columbia during the STS-107 mission. "We've beeninterested in making sure this mission is as successful as it can be," Collinssaid. "Not only that, but making sure that we do the right thing not only justfor STS-114 but for every mission that's going to follow us." Columbia was destroyed on Feb. 1, 2003, asit reentered the Earth's atmosphere after a successful science mission thatbegan 16 days earlier. But launch debris from Columbia'sexternal tank separated at launch and struck Columbia's left wing leading edge, fatallycrippling the spacecraft's vital heat-resistant skin. During reentry, hot gasesentered the hole from that collision and led to the orbiter's destruction. "Asdifficult as the [Columbia]accident was, I think the accident has given all of us a sense purpose and thathelps us all in dealing with the loss," Patrick said. "Instead of shutting downthe space program, which might have happened, we've taken the lessons learnedfrom Columbiaand applied them to the shuttle as well as the next vehicle." Familymembers of Columbia'slost crew issued a statement before Discovery's initial launch attempt andpraised the efforts of accident investigators, NASA and the independentoversight panel that watched over the agency's return to flight work. "We hope wehave learned and will continue to learn from each of these accidents so that wewill be as safe as we can be in this high-risk endeavor,'' the statement read. "Godspeed, Discovery." Today alleyes and more than 100 cameras - ranging from high-power imagers on the groundto aircraft-mounted systems - will be on Discovery's ascent, watching closelyfor any signs of ice of foam debris from the shuttle's external tank. A cameramounted on Discovery's external tank gave flight controllers a spotless view ofthe moment of separation, when Discovery cast off the fuel tank and headed onits way. Bob Page,head of NASA's intercenter photo working group, saidimaging officials should receive the first high-definition television images ofDiscovery's launch about 15 minutes after liftoff. Additional telescope, radarand high-resolution data will be processed as it comes in throughout the day.Video from Discovery's solid rocket boosters and shuttle-mounted systems willbe relayed to the working group in the next two to three days, he added. NASAofficials hope that a photography experiment- which put visible and infrared telescopes in the turret nose of ahigh-altitude aircraft - will provide high-resolution images up through mainengine cutoff. NASA hasspent the last two years working to meet 15 return to flight recommendationsfrom Columbia accident investigators, who believed should be addressed beforetoday's launch. The Stafford Covey Return to Flight Task Group - an independentgroup that watched over NASA's work - passed the agency on only 12 of thoseitems, but said NASA had met partial requirements of the remaining three. "I believethere is a resolve now at NASA that is similar to the resolve that existed justafter the Apollo 1 fire," former NASA flight director Gene Kranztold SPACE.com, before the launch. "And that resolve, I believe, willprevent another accident like Columbia." Discovery'screw has had a busy day, with more work in space ahead of them. They awoke thismorning at 12:30 a.m. EDT (0430 GMT) and together and took a crew photo beforedonning their orange flight suits and walking out of the astronaut crewquarters here to cheers and applause. Most of the crew had a light breakfastbefore today's space shot, with Collins choosing whole wheat toast and fruitwhile Kelly opted for mixed fruit alone. The STS-114 spacewalkers, Noguchi andRobinson, each chose fruit and a meat sandwich. Noguchi settled for steak,while Robinson chose chicken and later strummed on his guitar. "Steve isquite the musician," said shuttle pilot Alan Poindexter, currently assigned toNASA's STS-120 mission. "He's quite the accomplished guitarist." Theastronauts will conduct a photo survey of their external tank - a typical post-launchtask - much earlier and closer to the tank than on past flights to get anup-close look at how its insulation foam weathered the space shot. The surveyis also designed to verify how modifications to the tank,such as the removal of foam along a bipod fitting that connects to theshuttle, performed during launch. Beforeentering the orbiter, some STS-114 crewmembers took time to send messages hometo their loved ones. Camardadisplayed a sign emblazoned with 'Hi Dad!' and others with more messages to hisfamily. Kelly embraced members of the seven-person close out crew assisting theSTS-114 astronauts before boarding Discovery. Soichiproudly waved a sign that read 'Out to Launch' as well as a JAXA flagcommemorating the 50th anniversary of the agency's launch vehicledevelopment. The pad close out crew shut Discovery's hatch at about 9:00 a.m.EDT (1300 GMT). Theastronauts conducted a photo survey of their external tank - a typicalpost-launch task - much earlier and closer to the tank than on past flights toget an intimate look at how its insulation foam weathered the space shot. Thesurvey, which brought the orbiter within 1,500 feet of the tank, is alsodesigned to verify how modifications to the tank - such as the removal of foamalong a bipod fitting that connects to the shuttle - performed during launch. Thomas tookdigital still images of the tank while Noguchi recorded it with a video cameraabout three minutes after the shuttle reached orbit, though the images will notbe relayed to the ground until later in the mission, NASA officials said. Later, thecrew will perform initial checks of Discovery's robotic arm, a task typicallyreserved for Flight Day 2, and also take images to make sure that the orbitalboom and the shuttle's antenna survived the launch unscathed, NASA officialssaid. They areexpected to return to Earth here at NASA's KSC Shuttle Landing Facility on Aug.7 at 5:46 a.m. (0946 GMT). "Flying in spaceshows one of the great aspects of the human spirit and we are really honored tobe a part of it," Robinson said.